At the Leclerc shopping centre in Saint Paul les Dax, in the region of Aquitania, we can find a multitude of specialised shops, and clients can enjoy a space for wellbeing, to take an hour for themselves. The cosmetics and perfume shop also contains an institute for body care, manicure, make-up and other beauty treatments. 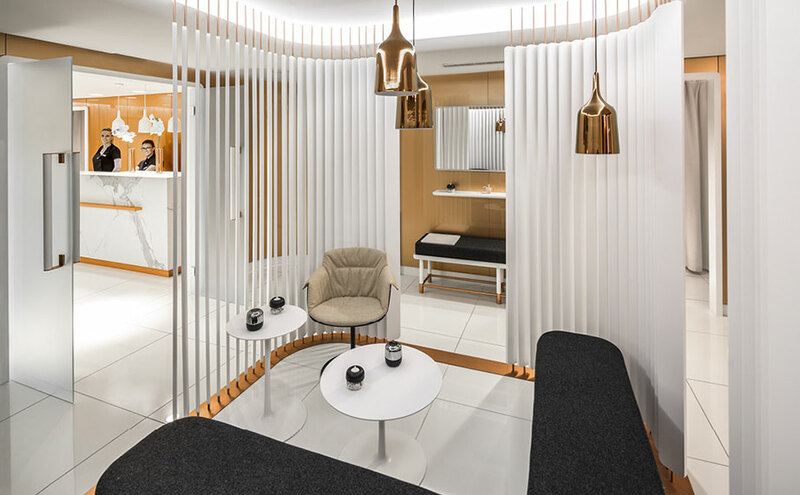 This space was designed by Béatrice Oréal. We find the solid surface from PORCELANOSA Group in the countertops and dividers, a work carried out by interior designer Béatrice Oréal, who was able to take advantage of the properties of KRION®, using thermocurving and machining to generate a waiting area with dividers, creating a welcoming atmosphere in a room with high visibility. In the cosmetics sector hygiene is one of the most important values, making KRION® an ideal material due to its easy cleaning and additive-free anti-bacterial property.